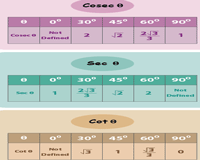 Integrate the visual aid trigonometry tables and printable charts in your math class to help high school children learn the trigonometric identities and ratios with ease. Included here are charts for quadrants and angles, right triangle trigonometric ratio chart, charts for trigonometric ratio tables, allied angles, unit circle charts to mention a few. Instantly review the knowledge acquired by using the blank charts provided here. Printer friendly charts are also available. 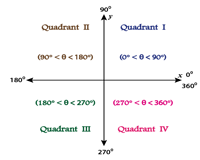 Gain a clear understanding of degrees and radians that appear in each of the four quadrants with these exclusive quadrant charts. 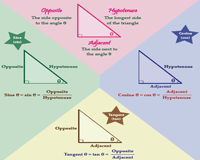 These vibrant charts help learn the names of the three sides of a right triangle. Learn the easiest way to remember the primary ratios using the SOH-CAH-TOA chart. 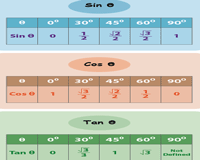 The display chart here focuses on the primary trig ratios - sin, cos and tan. Hand out the blank templates to the learners for a quick review. 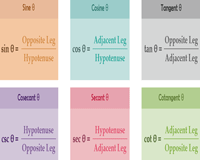 Supplement your teaching of reciprocal trigonometry ratios - cosec, sec and cot with this visually appealing chart. 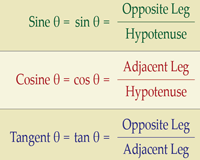 The six trigonometric ratios, both primary and reciprocal are displayed in this chart and help to review and recollect the trigonometry ratios with ease. Serves as a top-notch reference for the three primary trigonometric ratios of special angles. Observe and learn the values for particular degrees and radians from the display charts here. 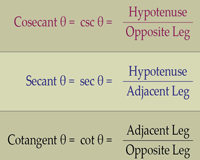 The chart here encompasses a table of values for the degrees and radians of the three reciprocal trigonometric ratios of special angles. 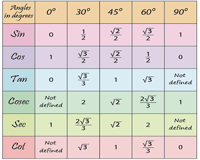 Utilize this chart containing a table of values for different degrees and radians to recall the six trigonometric ratios for special angles. 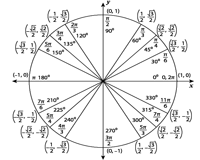 This circle-chart helps to find the functions of trigonometry that are most simply defined using the unit circle. 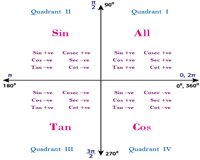 The informative charts here help grasp the trigonometric ratios of allied angles for quadrants, degrees and radians with ease. 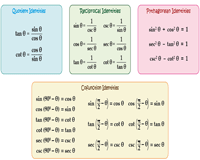 The six charts here consist of all the commonly used trig identities one needs to memorize to become a trigonometric expert. 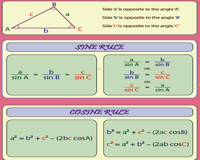 Learn the important rules - the Sine Law/rule and the Cosine Law/rule; relating the angles and sides of a triangle from this display chart.